The Sarnian’s first video — trailer, if you prefer — went live on YouTube today. It’s just over a minute long, but it gives you a good intro to what the series is all about. We’ve embedded it above so you can take a look without clicking away. How many Guernsey locations can you spot in total? Marble Bay(Le Pied du Mur) is pretty obvious, on account of the stone marker at the top of the steps that leads down from the coastal path. You can’t miss the Cup and Saucer (Fort Grey), either, seen in all its glory with its night-time illumination. 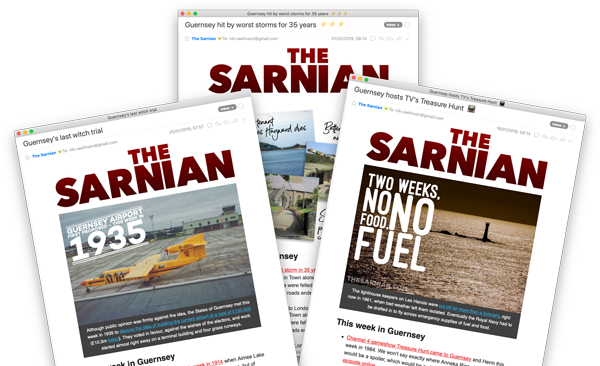 The round observation tower seen briefly behind the newspaper front page is the preserved tower at Pleinmont, which plays a part in Sarnian 2: Blowfish, and if you look carefully you should also catch sight of Saints Harbour. There are others, though, waiting to be discovered. If you haven’t yet downloaded a copy of The Sarnian: Dead in the Water, check it out at one of these online stores. After five years under German rule, stories about life in occupied Guernsey were keenly sought.